Who is responsible for the cost of an accident when there is a multi-car pile-up? Normally, when a car hits the vehicle ahead of them, the car behind would be held liable. The automatic assumption is that the car travelling behind must stay a safe braking distance behind the car in front. Whose negligent actions set off the chain reaction? Were other drivers speeding or driving too close? The police report will usually cite which car is at fault as it examines and explains how the accident occurred. Most often it is one car that started the chain reaction in a multi-car pile-up; however, it is possible for two or more cars to share the blame for a multi-car accident. The amount of blame or “fault” will be determined by either the police officer who writes the report or by the insurance adjusters, negotiating for an optimum solution. For example, one driver may be deemed to be 80% at fault, while another driver takes the remaining 20% of the blame. It is possible for several people to share in the fault, or even everyone involved sharing some of the responsibility. The more details, cars and people that are part of the scenario, the more complicated the determination of fault becomes. See in this video how the chain reaction just keeps happening - taken on Sunday, December 8, 2013 in Milwaukee. What kind of insurance coverage do I need if I'm involved in a multi-car accident? The damage to the vehicles involved in multi-car accidents is often more extensive than a one or two-car accident. Vehicles are often hit in different areas, sometimes over and over. There is an increased likelihood of bodily injury because, again, the vehicles are often hit over and over again. Both drivers and passengers are statistically injured more severely in multi-car accidents. If you are found at fault for a multi-car accident, for any percentage of the blame, you could be sued by other injured parties. Carrying adequate liability coverage can shield you from most or all of this, especially when it's coupled with an umbrella policy. Additionally, liability insurance pays your legal defense costs should an injured party sue you. What should I do to protect myself if I’m involved in a multi-car crash? Most importantly, stay in your vehicle with your seatbelt fastened. Make sure everyone else in your vehicle has their seatbelt fastened as well, until law enforcement or EMTs give you the OK to exit. Keep in mind that there are still thousands of pounds of metal and glass moving toward you, and you could still be hit a second or third time. This video shows how dangerous standing outside your car can be. Put your hazard flashing lights on. After law enforcement has secured the scene, and if you are in a position to collect your thoughts, it would be wise to take a few minutes to record your observations on the incident. With large incidents, ensuring that your involvement is thoroughly detailed will be important when claim time comes. Once you've been in an accident, notify your insurance carrier or agent immediately. Knowing what you now know about multi-car accidents, reviewing the liability limits on your auto policy and having the discussion with your independent insurance agent about an umbrella policy is the next step to making sure you are safe and protected should any multi-car accident happen to you. Contact a knowledgebroker for more details about liability coverages, umbrella policies, or for Wisconsin residents to get a quote on their auto and home insurance. 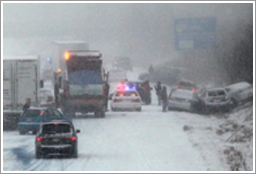 Our thoughts and prayers go out to the injured and their families from Sunday's extensive, weather-related, multi-car pile-ups that occurred all over the metro Milwaukee area. Be safe out there!